De-Sta-Co manual clamps, hydraulic clamps, toggle clamps and clamping systems in stock. 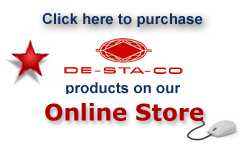 Welcome to the new De-Sta-Co On Line Product Catalog. De-Sta-Co pioneered the development of toggle clamping over 60 years ago and still manufactures the world's broadest and most recognized line of these useful and adaptable tools. Today, De-Sta-Co's offerings go well beyond manual toggle clamps to include air and hydraulic clamps suitable for a wide range of applications. Over the years, De-Sta-Co Clamps and clamping systems have set the industry standards for quick-action and safe product holding and fixturing. This catalog contains about 500 different Destaco standard, over center toggle clamps and clamping systems. De-Sta-Co offers a complete selection of manual and pneumatically operated toggle clamps, various types of special clamps, and a line of advanced Hydra-Dyne® power clamps, all of them backed by full-service manufacturer's support. Most of these items are available for off-the-shelf delivery. In most cases, two different part numbers are given for each item. The 5 digit number in bold is an EDP part number in accordance with electronic data processing (EDP). DE-STA-CO UPC identification number (697437) is followed by De-Sta-Co's part number. For example: 69743752010 would represent De-Sta-Co Model 201. If you do not use the EDP system you may order using model number only. You may also browse page by page using the "Next page" button at the bottom of every page. and engineering support as De Sta Co. The world leader in clamping. Manual Clamps, toggle clamps, pneumatic clamps, Hydra-Dyne Clamps, Hydraulic Clamps and more.